Deulajhari, is the ancient citadel of Saivism is located in the Angul district of Odisha. This attractive place is having 24 acres & 55 decimals of land and covered with indigenous- jasmine forest (kiabana). 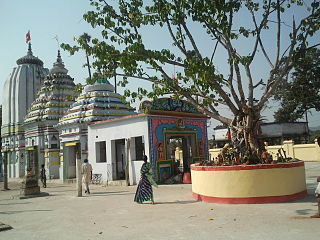 It is mainly famous for hot spring and a very old ancient Siva Shree Siddeswar Baba temple. The Deulajhari hot water spring originates from below a Shivalinga which attaches a distinct religious attribute to it. The hot water from the Deulajhari spring is collected into 36 man made ponds which circumscribe a Shiva Temple. 50 percent of the springs in the region are cold springs which lies attached to the hot springs, this very phenomenon is considered to be a miracle of nature. The waters of the Deulajhari hot spring is believed to contain medical properties that can heal a number of diseases and therefore travelers and pilgrims come here for curative and religious purposes. As per the ancient records there were eighty-four such springs. But many of these have been overshadowed in the jasmine forest. Now twenty-four springs are alive. Among these, the springs bearing the names like Agnikunda, Taptakunda, Himakunda, Amrutakunda and Labakusakunda are prominent ones. The temperature of water in these springs varies from 40 degree Celsius to 62 degree Celsius.Most Important and unique thing of this hot spring is two ponds are attached with water flowing to each other and one pond is having hot water where as another is cold. This is the most interesting and unbelievable thing of Deulajhari hot spring of Athmallik,Angul District. The temple complex covers an area of twenty-four acres of land. The presiding deity Sidheswar Baba adores the main temple. The other important temples in the complex are Kedareswar Baba, Enkari Mata Maa Mahaswari, Sri Maheswar Baba, Sri Jogeswar baba and Maa Khambeswari. Mythologically, the place is related to the age of Tretaya in which the lord Rama along with Sita Devi and the younger brother Laxman worshiped the Lord Shiva at this place in course of their fourteen years exile life. In the world of spiritualism the place is also viewed as the Adipitha of Lord Jagannath. But how and when this pitha became the saivic place of worship is yet a topic of research. Historical records show that the presently standing main temple was built by the King Kishore Chandra Deo of Kadamba Dynasty in the year 1936. Subsequently adjacent temples in the premises were built by other benevolent persons and devotees. In each Amabasya (new moon) and Sankranti (1st day of the month) people from far off villages gather here to offer their obeisance to Sidheswarbaba, the sylvan deity of the temple. Apart from this a large number of people gather in the temple during the months of Baisakha(summer season), Kartika (dewy season) and Magha (winter season). The important fasts and festivals are Panasankranti, Sitalasasthi, Kartika Purnima, Makarmela, & Sivaratri. The other significant feature of this place is Barunisnahanayoga. The Jagannath Panjika is the prevalent Panjika of the temple. As per this panjika in the year 1971 there was a Barunisnahanyoga at this place. The devotees take holly bath in the Baruni stream that flows near the temple.